The Wellesley Wine Press: Value Wine Discovered...at a Steakhouse! merchant with free delivery in this Boston area. Check 'em out. Finding value wines in a steakhouse setting is challenging. The big name wines (Cakebread, Caymus, Silver Oak, etc) are so marked up they're hard to enjoy. I usually "bail" and go for a couple wines by the glass to keep costs contained and try new things. I'd had the Termes and Muga before, and enjoyed them both, but I'd never tasted this bottling from Juan Gil before. 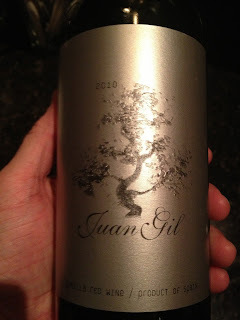 I've enjoyed George's Monastrell picks in the past so I was excited to try the Juan Gil. When we were seated I mentioned to our served I'd gotten a recommendation from George for a Spanish Monastrell. He immediately knew it was the Juan Gil I was after - it sounded like it's been a successful wine for them. Like I mentioned in this post about a great $7 Garnacha, Spain is a the place to go if you like the flavor profile of domestic red wine and you're looking to save some money. The wine was served at what I thought was the perfect temperature, probably around 60-65 F. The wine was immediately aromatically present with gorgeous fresh vibrant fruit supported by just a hint of the affects of a moderate oak regiment. The wine was versatile. It was tremendously enjoyable on its own, with a salad (their wedge of course! ), and with appetizers. It paired very well with their Kona Crusted Sirloin. I don't think I've ever gotten so much positive feedback about a wine -- all unsolicited -- in a situation like this. Both during the meal and the next day people were gushing on about how much they enjoyed the wine. The great thing about it is it's near the bottom of the price spectrum of The Capital Grille's wine list. It can be found for $10-$12 at retail and that makes it a great daily drinker and a tremendous value in a restaurant setting. Highly recommended. My thanks to George for the recommendation and hospitality! Question of the Day: What are some of the best values you've found at high end steakhouses? What's your strategy for finding value?